What could be more delightful than setting out for the lake on a bright, clear July morning with the prospect of a day full of float flying ahead? The plane was in great shape and required only minimal preparation for flight. 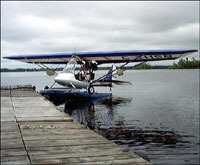 I fly a Beaver RX550, with a Rotax 582, on Full Lotus Floats, from Lake Wilcox, just north of Toronto, Canada. There was enough breeze to raise a light chop on the water, but not enough to make taxiing difficult. The warm-up went smoothly, the mag check was fine, and soon I was skimming along the lake on the step quickly reaching lift-off speed. With gentle back-pressure on the stick we broke free of the surface and lurched forward with the sudden loss of the water's drag. Climbing steadily into the July sky, I reflected again that float-flying truly is the hard drugs of aviation! With a gentle climbing turn to the north, I was over the golfers’ paradise just east of Aurora. Blue skies and the lakes of Muskoka beckoned. Radio traffic was light and I seemed to have the sky to myself. Without warning the engine started to wind down, lose revs and power, and within about thirty seconds it died. I pushed the stick forward to maintain gliding speed, switched fuel tanks and attempted a restart. With lots of primer and some fairly enthusiastic throttle work, the engine started. It started, but it ran rough and with so little power, I shut it down. It was distracting me from the job at hand and I was afraid it might start to surge on short final and propel me beyond my chosen landing point. Landing in a beanfield on floats, you don't get much of a roll-out. The deceleration was dramatic but not uncomfortable. I popped my harness, checked that the fuel and electrical systems were off, and hopped out into the beans. I was unhurt but the plane was sitting at a slight angle that suggested some damage. Close inspection revealed a fractured right rear float attachment bracket. Not a big deal. Everything else was intact and undamaged. The cell-phone is a godsend in such situations. I managed to reach my son Peter, and reel off a list of tools and equipment I needed him to bring me. He was very generous with his time and help, and made many useful and insightful suggestions. He was also very diplomatic in conveying to Nancy why he needed the car without causing undue upset. I also called Flight Services to report my situation and pre-empt any Search and Rescue mobilization. We spent the afternoon mounting the amphib gear, repairing the the bracket, and trouble-shooting the engine. The next day, with my newly cleaned and reassembled carbs, I returned to the plane. Peter had other plans (who could blame him? ), so I was on my own. I reinstalled the carbs, replaced the fuel filter, and hit the starter. The engine roared to life and then purred like a kitten, a loud kitten. When fully warmed up, I gradually increased the revs and started to taxi uphill toward the high end of the field. The engine had now run flawlessly for over half an hour. Was that enough to prove its reliability? Was there anything else I should do before trying it in flight? Well, there was another problem. The field sloped downward from East to West. A shallow gully cut across the South-West corner so the longest practical take-off run would be from South-East to North-West. The biggest unknown was the length of the takeoff run. I knew how much run I needed for takeoff from water, or level pavement, or grass, but a farmer's field with knee-high bean plants was a mystery. Fortunately, the field was not significantly furrowed and the plants were sparsely planted. The downward slope should help, but would it be enough to offset the drag of the beans? I paced out the field, twice, but the unknowns remained unknown. Fortunately, the over-run from my intended takeoff path was into high, dense weeds, which would give gradual braking if I wasn't airborne by my go, no-go point. I had a careful look through those weeds to be sure there were no hidden ditches or fence posts waiting in ambush. I taxied to the top of the hill and put the throttle to the stop. As the tail lifted it became painfully obvious that there was a definite "sweet spot" to find and hold. Too much aft stick and the float heels dragged through the beans, slowing us down. Too much forward stick, and the plane started nosing over, dragging the front float bottoms through the beans. My speed was slowly rising. I needed 42 MPH to fly. At 37 MPH, with about a quarter of the field to go, a small ridge bounced me up into the air. The next two seconds comprised the best, most disciplined flying I have ever done. The urge to pull back on the stick and try to stay airborne was huge but I knew I didn't have enough speed and would probably stall if I tried to force it into the air. I did my best to maintain that "sweet spot" attitude. We sank back to earth lightly and almost instantly were airborne again, this time with enough speed to stay aloft. Staying low, in ground effect, the speed built rapidly and we were soon climbing away with airspeed to spare. 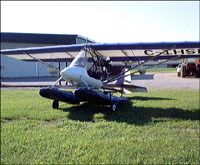 The next hurdle was retracting the gear so I could land back at my float base. The amphib gear was supplied with an elaborate release and retraction mechanism. Elaborate and sophisticated, and requiring much tinkering to get it just right. To save time and trouble, Peter and I had not bothered to install the formal retraction mechanism. Instead we had improvised with ropes and "pulleys" around the front spreader bar. If problems arose, I planned to use the tee shaped handle of my paddle as a hook with which to trouble-shoot. I climbed to 1000 ft AGL before attempting to retract the wheels. Holding the stick in the crook of my left elbow, my left hand was free to pull the rope on the locking mechanism while I pulled the rope on the right wheel. Up it came and locked into position. The process was repeated with the left gear, again going smoothly. For safety's sake, I climbed to 1500 ft and headed for home. The thunderstorms held off long enough for me to get home, landed and docked before the skies opened with a vengence, as I plucked bean plants from my under carriage. I think Full-Lotus Floats deserve the credit for this story's happy ending.